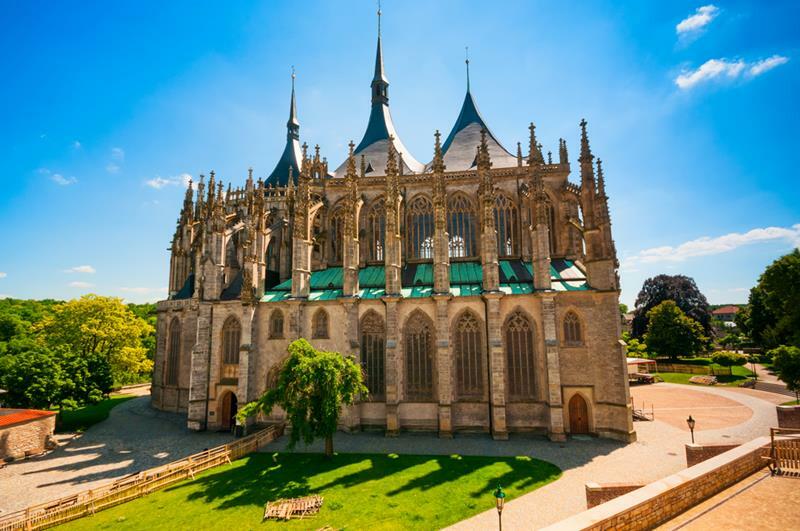 Discover why Kutná Hora is rated amongst the most amazing sites in Europe. Take a day trip to this incredible UNESCO world heritage-listed town. Visit the chapel decorated with nothing but human remains. Meeting in Prague’s Old Town Square, the tour starts with a train ride (ca. 1 hour) from Prague’s Hlavní Nádraží train station, through lovely Bohemian countryside, to Kutná Hora. Then you visit the eerie Sedlec Ossuary. Below the 15th century Cemetery Church of All Saints at the center lies the curiously fascinating Bone Chapel. After a lunch break at an excellent and very modestly priced (main course around 5 EUR) Czech restaurant you will take a tour through Kutná Hora’s UNESCO World Heritage Old Town. You might stare in awe as the guide shows you a chandelier comprising of at least one of every bone in the human body, pyramids of skulls and delicately crafted shields of arms made of…yes, you guessed it, arms! Kutná Hora however is much more than the Bone Chapel! Thanks to the town’s prosperous silver mines, Kutná Hora became the second most decadent city in the Bohemian kingdom in the middle ages and flourished, rivaling Prague economically, culturally and politically. Eventually, the silver dried up and the town was ravaged by two Holy Wars, but what was left behind still wows tourists to this day: beautiful buildings such as the glorious gothic masterpiece St. Barbara’s Church, the sumptuous Italian Court and Royal Residence and Hrádek, shape an exquisite landscape. Book a classical music concert. 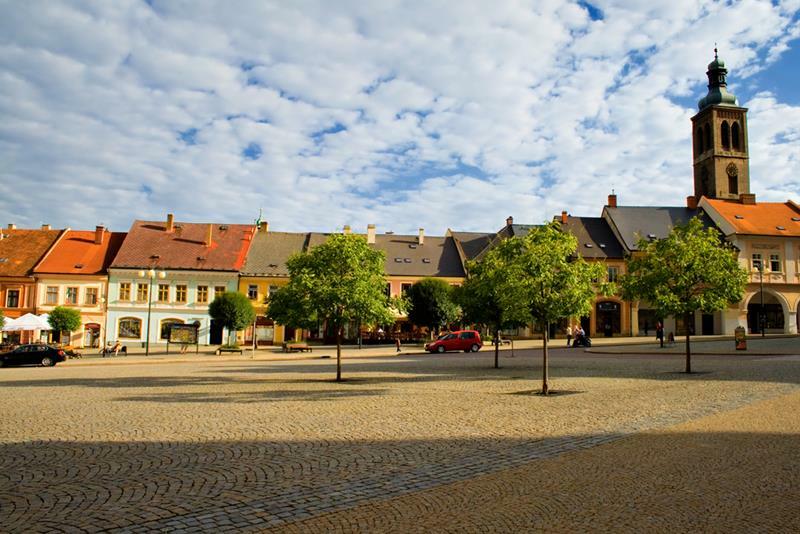 The city is located in the Central Bohemian Region. Kutná Hora was inhabited as early as in the 10th century, but blossomed into town in the 13th century when the silver was discovered in the area. Silver mining brought great wealth to the town. is a Roman Catholic church built in Gothic style. The church is dedicated to St. Barbara - the patron of the miners. The construction took nearly 500 years. The first architect is said to be Johann Parléř (son of Petr Parléř, the famous architect of St. Vitus Cathedral and Charles Bridge in Prague). You will be captivated by the interior full of Gothic and Renaissance paintings. Part of the UNESCO Heritage and one of the most stunning churches in Europe, be sure to have enough time to explore the St. Barbara´s Cathedral. is the former Royal Mint where the silver coins were produced during the Kutná Hora´s time of wealth and glory in the middle ages. The original treasury rooms hold an exhibit on coins and minting. The complex of buildings is now used as a City Hall as well as museum. The Gothic stone fountain on Rejsek Square was built in the 15th century by architect Matěj Rejsek (who also worked on the Church of St. Barbara and is the author of Powder Tower in Prague). The large fountain has twelve sides, is four meters tall and originally had a hexagonal roof. The fountain used to supply water to Kutná Hora when local water supply was cut off during the silver mining. Water was brought in through wooden pipes from a well few kilometers away. After dark you can enjoy the sight of the fountain being beautifully lit up. If you like unusual things, this place should be on your list of places to see. The ossuary is located around 1 km away from the Kutná Hora train station - you can get there by either train, bus or taxi. The ossuary is in the undeground chapel of the Church of All Saints which was founded in the 13th century. The present appearance is the work of a woodcarver František Rint who was commissioned in 1870 to decorate the chapel. For that he used bewteen 40 000 - 70 000 bones. His fantastic creations include a coat of arms of the local aristocratic Schwarzenberg family and a chandelier that contains every bone in the human body. If you are visiting the Ossuary, take a short walk to the Cathedral which is also on the UNESCO World Heritage site. The cathedral was built in the High Gothic style in the 13th century on the ruins of old church and it was the most magnificent church in the Kingdom of Bohemia. The church was burnt down by the Hussites and was again refurbished in the 18th century in the Baroque Gothic style. Petra was our Guide. She is so smart and is so happy to share her knowledge of life, arts, Prague, Czech, and so much more! She made out trip to to Kutna Hora extremely enjoyable and rewarding. It was the perfect amount of time for a tour and it felt like a complete experience. If this tour was not on the last day of our vacation, we would have signed up for more! Thank you for a great experience! Tour was very fun and convenient. Adam was fun and knowledgeable. He gave a fun personal perspective and made it a great day. The restaurant the he took us too was also awesome and very reasonably priced. Mit Petra hatten wir eine sehr kompetente Reisebegleitung die uns viel zur Geschichte der besuchten Orte, und auch darüber hinaus erzählt hat. Dabei war die Art der Vorträge stets kurzweilig. Mir hat besonders gefallen, dass man tiefgreifende Informationen erhalten hat, ohne mit unnützen Zahlen erschlagen zu werden. Daumen hoch - immer gerne wieder!